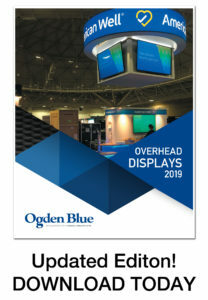 The Ogden Blue Overhead Displays catalog provides a complete lineup of display shapes, offered in any size that will fit your exhibit space. Overhead trade show displays help you take advantage of the whole space at your next trade show or convention. Ogden Blue will help you create a hanging banner or overhead display to help you draw more attention to your company’s brand, to make it easier for potential clients to find your booth, and to give you the visibility you need for the entire show.